Anita was born in London in 1947. She moved to Cornwall in 1988. 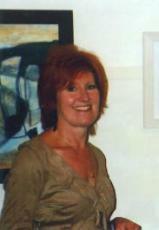 Former hairstylist, hotelier and now running a B&B she has always pursued her passion for painting. She lives in Padstow but travels to St.Ives on a regular basis to study at The St. Ives School of Painting. She studied Fine Art part-time at Falmouth College of Art,graduating with a B.A. Honours Degree in 2000.Anita is also a member of The Porthmeor Group. Her inspiration comes from the landscape and the lush tropical gardens of Cornwall. She responds to her own experience in the landscape by seeking to capture that intimate sense of place, atmosphere and mood.